Detailed introduction to PTFE Oven Liner :It slides beneath your electric oven's bottom is used for catching all the messy drips from pies, cakes, and casseroles that bubble over then you can just wipe them right off the slick surface. It can bear hard scrubbing every time. 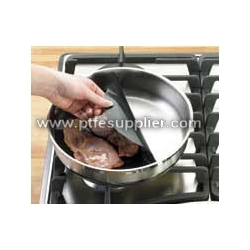 It will not affect browning or slow-cooking, and resists heat to 550 degrees dishwasher-safe. For electric oven, place under heating element. For gas oven, place on bottom rack. 1. Teflon non-stick baking mat liner can be used to protect the bottom of the microwave / oven / grill / pan / pot / frying pan, etc. on the splash, drip chaos, fat acute confusion brought on sugar, so your appliances clean . 2. .3 To adapt to a variety of oven. Excellent resistance to viscosity, can easily remove surface oil, (to stain with soap and water, can be repeatedly used 300 times or more). 4. Can prevent stains in the baking process spills into the oven bottom. 5. High temperature, continuous operating temperature from -60 ~ 360 ℃ 6. Non-toxic, food contact may want to secure, corrosion resistant power safe. 7. Customized packaging and size you need. 8. Food-grade standards. Jù sì fú yǐxī bómó shì yóu jù sì fú yǐxī shùzhī jīng móyā, shāojié, lěngquè chéng máopī, zài jīng chēxiāo, yāyán zhì chéng. Chēxiāo chéng de bómó wéi bù dìngxiàng báo Mó, bù dìngxiàng bómó jīng yāyán hòu jí chéng dìngxiàng bómó. Bù dìngxiàng bómó yāyán 1.1-1.8 Bèi wèi bàn dìngxiàng bómó. Jù sì fú yǐxī bómó yòng yú diànróngqì jièzhì, zuò dǎoxiàn juéyuán, diànqì yíbiǎo juéyuán, mìfēng chèn diàn. Tā jiéjīng dù gāo, fēnzǐ dìngxiàng jǐn jǐn páiliè, kòngxì lǜ xiǎo, yīn'ér jù sì fú yǐxī bómó yǒu jiào dà tígāo. Jù sì fú yǐxī bómó fēn jù sì fú yǐxī cǎisè bómó, jù sì fú yǐxī huóhuà mó hé F46 bómó. TPTFE Oven Liner is molded, sintered, cooled to a blank, and then by turning, rolling made​​. Turning into a thin film is not directed Film, not directed film directed by rolling Serve film. Film Calendar 1.1-1.8 times the non-directional semi-directed film. PTFE dielectric films for capacitors, as wire insulation, electrical instrumentation insulation, sealing gasket. Its high crystallinity, molecular orientation tightly arranged, porosity is small, so PTFE Oven Liner has improved greatly. PTFE Teflon film sub-colored film, PTFE membrane and activation F46 film.